Whether you’re a new teacher or a classroom veteran, the school year can feel overwhelming, more so than ever since the demands of standards-based testing and professional development have grown increasingly complex and time consuming. Teaching now seems to require holding down two jobs at once: teaching kids with one hand and meeting a plethora of administrative mandates with the other. It’s tough to carry such a load day after day without sinking under the weight. An organizational system shouldn’t be so complicated that it takes hours to create and you have to remember what’s filed where when you’re looking for something. Backing up critical information is a must, but recording the same information in multiple places wastes time. 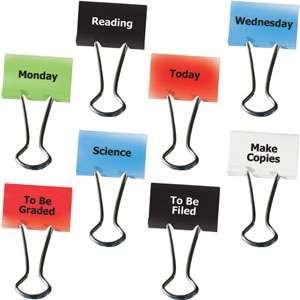 Organize your classroom in ways that work for you. Check out this list of 100 tips for classroom organization, many of them submitted by other teachers. Scroll down and you’ll find a mini-list of 5 online tools to use in getting organized. Also, visit this page at cybraryman.com for links to 32 articles (32!) with classroom organization tips and tricks. Keep an emergency folder for substitute teachers, whether the principal requires one or not. Include in it some solid but generic lesson plans and activities that would be good to use anytime and that won’t need updating. Keep them simple. Write plans that don’t require a lot of explanation for the sub or your students to follow. 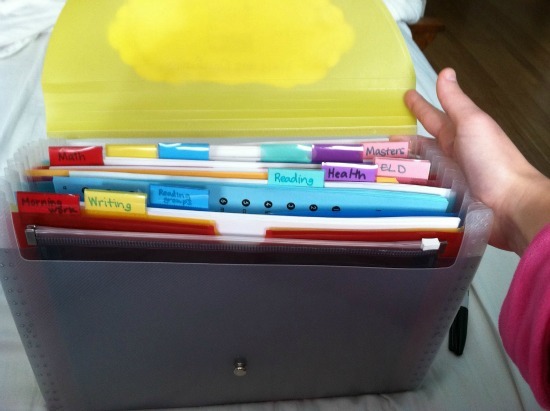 Assemble a folder for yourself with backup plans to employ if things fall apart in class for one reason or another. Writing activities, practice pages, and general review exercises are all good backup plans that would be useful throughout the year. Make sure the contents of your emergency folder are different from the materials in the sub folder. Use a “bell ringer” at the beginning of each class. The strategy gets kids on task immediately, and while they’re working independently for 5 or 10 minutes, you will have some uninterrupted time to take attendance and gather your wits. Keep a folder with a collection of writing prompts to use as bell ringers throughout the year. There’s no need to generate them yourself. Lists of writing prompts, many of them grade and subject specific, can be found on line. Other lists, like this one from dailyteachingtools.com, include prompts that could be used in several subjects. Type what you need into a search engine, and you’re in business. Educational research shows that kids should write in every class, for a variety of reasons, and bell ringers don’t have to be graded to be worthwhile. 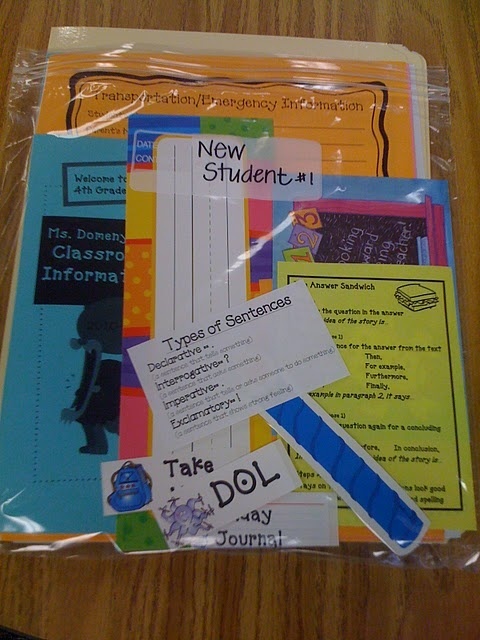 Put together some information packets for new students who show up unexpectedly in class. They can get settled, and you can keep teaching with a minimum of disruption. It’s nice to put a welcome note in each packet, since being the new kid in class can be tough. Schedule tests and quizzes when most students will be present to take them, instead of attending another teacher’s field trip or participating in some other school activity. Avoid creating make-up work when you can. Every teacher knows the difference between a “hard day” and an “easy day” in class. Balance them through the week to give yourself—and the kids—a break. Schedule assignments in various classes so that everything isn’t due at the same time, burying you under an avalanche of papers to grade. Don’t reinvent the wheel if you don’t have to. Using good lessons, quizzes, activities, and handouts created by somebody else or tweaking them to serve your own purposes saves time and complements your own planning. Thousands of free resources for all grades and subjects can be found on line, such as these documents at eNotes. Being proactive outside the classroom also makes teaching less stressful. By communicating with parents, students, peers, and principals, it’s often possible to avoid problems before they materialize and to build relationships that will pay dividends throughout the year. A heads-up before things get complicated is a “stitch in time” that can keep a situation from unraveling in very stressful ways. Considering all the demands teachers must meet every day, how much time does teaching require? The answer is “more.” Since there’s never enough time, spending some of it being proactive is a good investment. Preventing fires takes some time up front, but it’s much less stressful than racing through each day putting them out. Keep in mind, too, that football, falling leaves, and Halloween candy are more great ways to alleviate stress! Happy October, everybody! See you next time. PS – Looking for more tips on staying organized? We’ve collected some helpful pins and DIY guides on our “Teacher Tips and Tricks” Pinterest board. Check that out here.